There have been no exhibitions devoted to Cézanne’s portrait paintings since 1910, four years after the artist’s death. Yet of the almost 1,000 paintings he produced over five decades, until his death aged sixty-seven – he was a slow painter – around 160 are portraits. It’s not an insignificant number. One might surmise that the tendency has been to emphasise the still-lifes and landscapes through which, arguably, his modernity is most evident. You can easily observe, for instance, how Cézanne’s stacked rooftop vistas, with their pared-down geometries, express his dictum to treat nature (and artefact alike) “by means of the cylinder, the sphere and the cone.” This simplifying and paring down of form, with its emphasis on structure, broke away from Impressionism and its concern with capturing the ephemeral. Abstracted forms modelled through colour and built up with patchwork brushstrokes layer-by-layer to often shimmering effect are accompanied by Cézanne’s deployment of multiple perspectives, such as we see in the Courtauld Gallery’s undeniably strange and frankly disorientating Still Life with Plaster Cast, 1895, with its tilted planes, multiple viewpoints and disrupted perspective (an apple that appears to recede in the distance, in front of a painted canvas that does follow traditional linear perspective rules, is no smaller than the apples in the foreground). 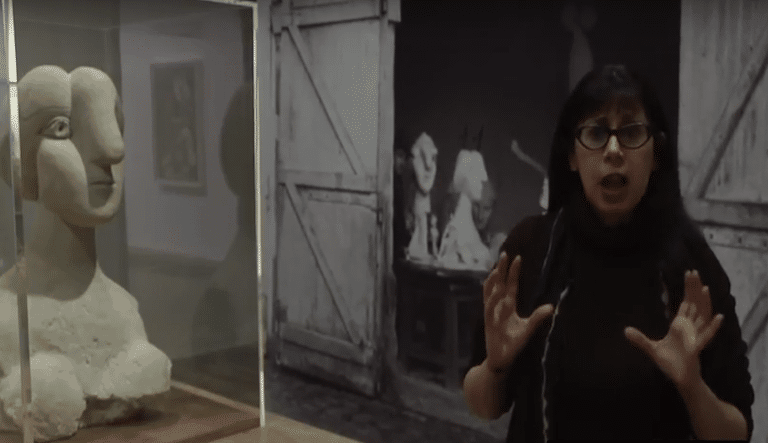 All are evidence of what Picasso and Braque took from him with the advent of Cubism, the most revolutionary painting movement of the twentieth century. 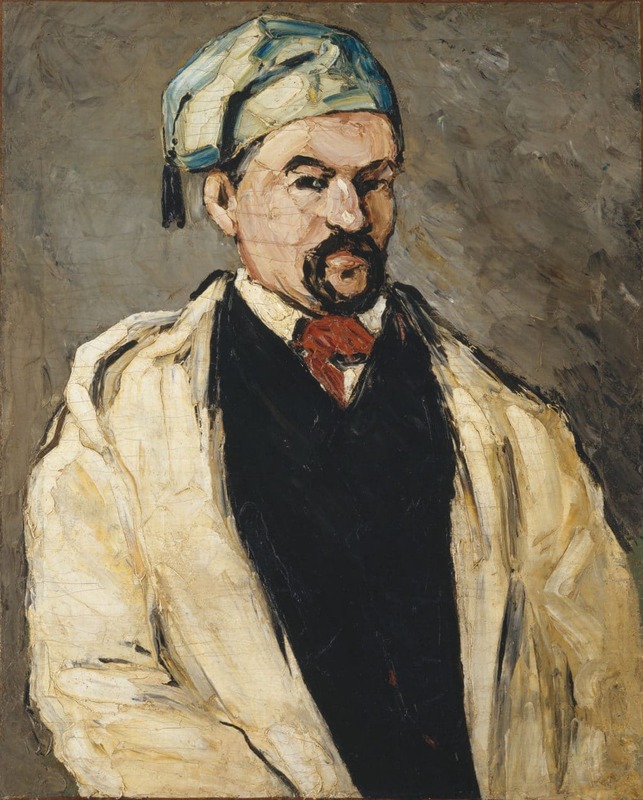 That Cézanne appeared largely uninterested in the psychological life of his painted subjects may be another factor in a lack of sufficient interest in a portrait survey. But as we see in some of his self-portraits and a number of portraits of his wife Hortense, some of which even verge on the tender, this isn’t always strictly true. What he does do is portray objects with as much care as he does his living subjects. His apples, one might say, are among the appleyest apples ever painted. And, of course, Cézanne’s portraits did contribute to the evolution of twentieth-century painting, even though they are also embedded in tradition. We can’t imagine Picasso’s portrait of Gertrude Stein and her impassive, mask-face without thinking of the steady, deliberating painter from Aix-en-Provence, who died the year it was painted. 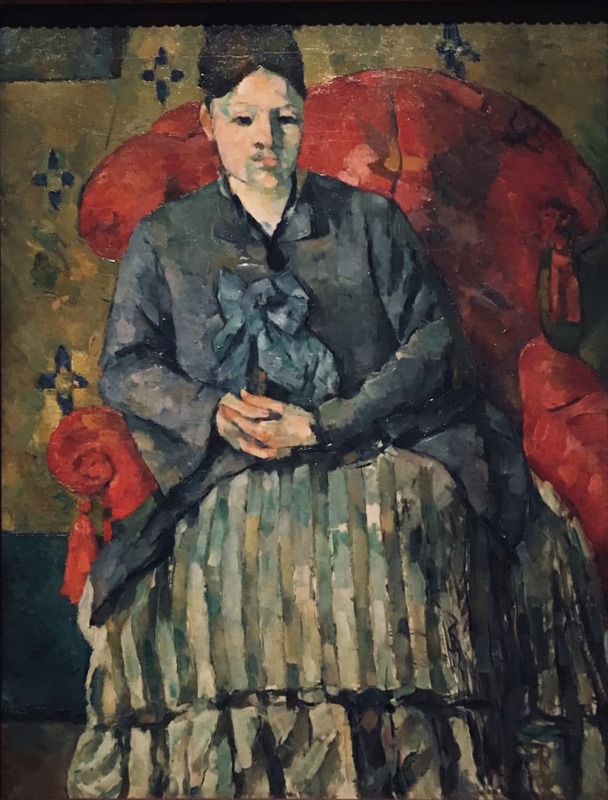 In fact, one of Cézanne’s most arresting portraits of Hortense, painted in 1881, though unfortunately not in this exhibition, shows his wife seated in an armchair, with her stone-mask head turned in a similar position to Stein’s in Picasso’s 1906 portrait. One of Hortense’s eyes is, strangely, completely blackened, a cavity. Picasso much have seen it in the Steins’ collection, since it was the first Cézanne painting that Gertrude and her brother Leo had bought for their growing avant-garde collection. This enigmatic painting is certainly one of Cézanne’s most unusual portraits. 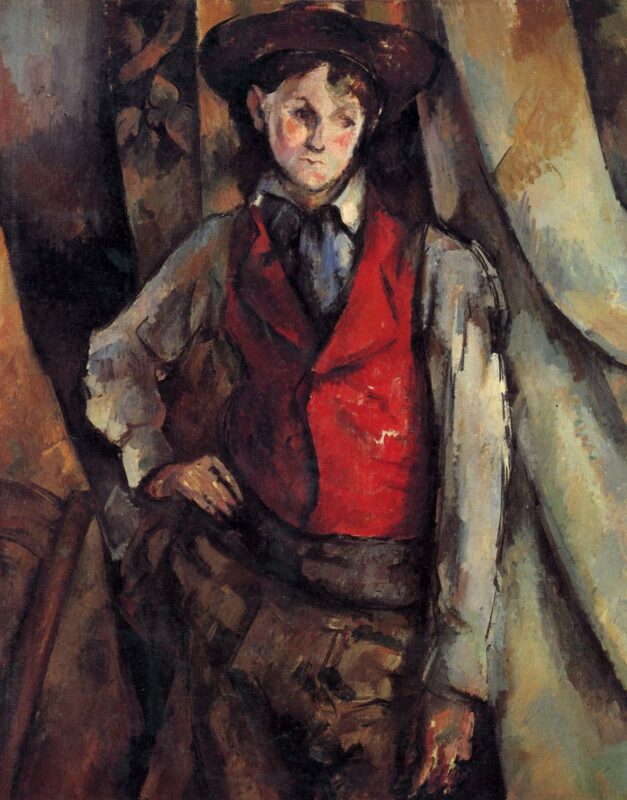 Similarly, when we look at the pleated, swagged backdrop of Boy in a Red Waistcoat, 1888-90 – which bits are curtain, which wallpaper, we might ask – we think forward to the faceted backdrop of Picasso’s Les Demoiselles d’Avignon, and the way that background all seems to push forward, disrupting our sense of perspective. But whatever the reasons for ignoring a curatorial study of the portraits as a body of work, one which highlights the fact that, like his series of paintings of Mont Sainte-Victoire, Cézanne’s portraits were often worked on as a series, or at least in doubles, the National Portrait Gallery’s genuinely surpasses all expectations. A collaborative effort with the Musée d’Orsay, from which it has recently arrived in some modified form, and the National Gallery of Washington, where it will arrive in March next year, it is a stunning survey. It carefully traces Cézanne’s development not just, of course, in one genre, but in terms of the overall evolution of his style. And like all great artists, we are taken freshly aback at just how brilliant, how innovative, how ingenious he was, even as the exhibition includes work that he himself considered a failure. Two late portraits of young friends, both in the exhibition, are instructive: one portrait was “angrily slashed to pieces with a knife”, although it was later repaired, the other took three months of dogged application, was then abandoned, taken up again, and then re-abandoned unfinished. Cézanne’s evaluation of his own failures shows, in fact, an acute objective judgement, but of the successes one can stare at length at isolated segments of each canvas, mesmerised by how he uses paint. Every segment, whether of hands, shoes, skirt, has the individualised, unmistakable hand of Cézanne, be they the early paintings of thick, creamy impasto – what Antony Valabrègue, a poet and childhood friend of Cézanne’s, as well as one of his sitters, called “mason’s painting”, since is was rough, thick and workmanlike – or the late portraits, with their shimmering palette of seductive colours. We begin with the portraits executed with a dour palette and painted roughly with a palette knife. Buttery slabs of impasto crudely contour the face of his uncle Dominique in several portraits of the mid-to-late 1860s. There is uncle Dominique in profile; in a turban; in a workman’s cap; with bulbous forehead and satyr-like with black goatie and dramatically fiendish gaze; as an inscrutable ‘Oriental’ in a tasselled Turkish hat; as a lawyer in cap and cravat, hands gesturing in a solemn oath. Uncle Dominique must have been a man of infinite patience, even though Ambroise Vollard, Cézanne’s dealer, must have surely been exaggerating, one hopes, when he said the painter usually demanded hundreds of sittings. No wonder Hortense often looked bored. Cézanne accepted no commissions, and painted only himself, his wife, his family, his friends, local villagers in Aix and those who worked for him, including his gardener Vallier, the last a gruff-looking, stoic and aged figure and the subject of his last paintings in the garden he tended. Here, in one of Cézanne last paintings, he almost fuses figure and foliage, with the green of Vallier’s shoes spilling onto the ground, creating shadows underfoot and spreading outwards to the shrubbery enveloping him. Cézanne painted six luminous outdoor portraits of Vallier, and they were painted in the last year or two of Cézanne’s life. Four are in this exhibition. Cézanne also painted around twenty-eight portraits of Hortense. The exhibition includes fifteen. These really are among the most captivating of all his portraits. By the late 1870s and 80s, when they were painted, he has departed from the skin’s beige palette and faces are modelled in delicate greens and pinks and blues, in an almost mosaic-like fashion. In Madame Cézanne in a Red Armchair, 1877, which is one of his truly great portraits, the mosaic effect makes the variegated stripes of his wife’s skirt shimmer in such a gorgeously luminous way that you almost can’t take your eyes off it, which, I should say, goes for the rest of this exhibition.